House Buying In Thailand Made Easy! Have you always dreamed of spending your life after you have retired in a tropical country like Thailand? Then you have probably thought already about how you want to live there. Most of our customers thinking of buying a house in Thailand. Often, many things such as the legal situation, purchasing costs and maintenance costs are still unclear and here we come as a real estate agent in Hua Hin into play to bring light into the dark. Should you buy a new house or a resale house in Thailand? One of the first questions you have to ask yourself is whether you want to buy a house that is already finished or if you prefer a new build one. Generally speaking one could say that about 50% of our customers decide to build a new house. Many developments in Hua Hin have an average construction time between 6 and 12 months and different floor plans to choose from. Usually modifications according to customer requirements are also possible to tailor the house to your needs. Often our customers do not want to wait or simply do not want the stress during construction of a new home. However, the situation is a little different than for example in Germany or Switzerland. In Thailand the developer of the residential development takes care of everything and you get a turnkey property at the end of the construction. That’s why it is not a problem if you are not on site during the construction phase. The responsible contact persons of the developments will send photos of the construction progress at agreed intervals. Of course, other customers do not want to wait and consciously decide to buy a house that has already been completed and may even be a little older. So, they know what you get. However, it is very important to inspect any resale house in Hua Hin carefully to make sure there are no (hidden) damages and all documents such as building permit, Title Deed etc are available. As your broker and contact person we will already review these basic documents when we list the property. If you want to live in the downtown area such as Soi 88 or Soi 94 you have to buy a resale house in most cases as land prices are exploding. Should you buy a house in a residential development or a detached one? About 90% of the houses we offer are located in so-called residential developments. These are compounds with a perimeter wall, an inlet gate and in most cases with security service. Often there are shared facilities such as pool, gym, etc. More and more facilities also offer a free shuttle service to the city center several times a day – ideal if you do not want to drive by yourself. Of course, these services and facilities must also be funded. Therefore, residential developments charge a monthly fee that varies from development to development. You will read more about this in the section of running and maintenance costs. A detached house is usually a little harder to sell as most of our clients quickly appreciate the benefits of a gated community. Many think the topic of security might be a problem for a detached house and people are afraid of burglaries. Of course, there are also burglaries in Hua Hin but much less than in most regions in Germany or Switzerland. Hua Hin is one of the safest areas in Thailand. In the end it depends on what you prefer. The additional costs when you are buying a house in Thailand are composed of various points and are also dependent on several factors. On the one hand we recommend that all our clients consult an independent lawyer to handle the transaction and check all related documents. The prices for the consultation, preparation of the sales contracts, due diligence and the transfer of the property should be between 40000 – 70000 Baht – depending on which company you choose. Taxes and fees are depending on the registered value of the property and whether it is a new building or a resale. In the event that it is a resale and the property was less than 5 years in the possession of the seller there is an additional 3% Specific Business Tax. Thus, you can expect about 4 -7% of the registered value of the property (not the purchase price) in taxes and fees. In 95% of cases all costs incurred are shared equally between buyer and seller (unless otherwise agreed). The additional costs of purchasing property in Thailand are therefore within manageable limits. We can find out very quickly about all the costs – so there won’t be any bad surprise later. What maintenance costs do you have to expect? 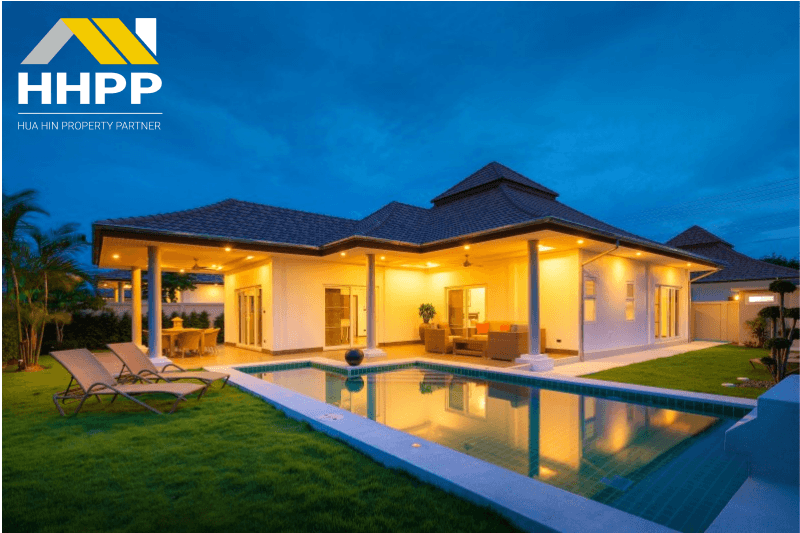 Here we have to make a clear distinction between a detached house for sale in Hua Hin and a house in a residential development. In almost all developments the house owners have to pay a monthly fee to cover the costs for community pool, security service, lighting of streets etc. The amount varies from development to development and which common facilities are offered. That’s why we can only give you rough guideline here. The cheapest developments common fees are just about under 1000 baht per month and the more expensive one up to 3000 baht. In the more expensive ones there is usually a free shuttle service to the city several times a day, 24 hours security and community facilities such as fitness room etc. In addition, the costs for gardeners and pool cleaning of the private pool are added. Again, the costs vary and depend on the size of the garden and pool. With a large 1000 sqm plot you can quickly spend 4000 or 5000 Baht per month for a gardener. A pool with standard size of 8 x 4 m costs about 2000 baht per month as the pool should be cleaned at least twice a week. Many residential developments in Hua Hin offer complete packages including the community fees and the gardening of your private garden and the cleaning of your private pools. Mostly the price depends on the size of the property. As an example we could take Orchid Palm Homes who charges 13 baht per square meter on a 550 sqm plot. The monthly costs are then 7150 Baht. This includes six time24-hour security, a community area for residents, a mini-market, a restaurant and a free shuttle service 4 times a day. With so many services this is a great deal! General maintenance costs do not apply here but also here the garden has to be maintained and the pool needs to be cleaned regularly. Water is a precious commodity today but it is not expensive in Thailand. Here is a crucial point if the house has a private pool and even then your water bill should be less than 1000 baht per month. Power is also cheap but especially air conditioners can consume a fair amount of electricity. It’s hard to give a number here. Some people are living in a 3 bedroom 2 bathroom house with a private pool and their electricity bills is only 3000 baht a month. Others would need 6000 Baht or more in the same house. From my own experience I would plan on an average of about 4000 to 5000 baht – I use the air conditioning very much and am not the most economical person and have never got a bill of more than 5000 Baht. What does Leasehold mean in Thailand ? Most foreigners that are thinking to purchase a property in Hua Hin or in Thailand stumble across the term “Leasehold” during their research and are wondering what this means. As a foreigner you can’t own land in their foreign name you basically rent the land plot for a period of 3 x 30 years and all costs are included in the purchasing price of the house. Under current legislation the lease agreements are limited to 30 years and can be renewed twice – payments for the two subsequent periods of 30 years are usually included in the purchase price. This gives you control of the land you have leased for the next 90 years. It is really important that the lease contract contains some important clauses. For example in case the law would change and allow foreigners to own land you have the right to change the ownership from Leasehold to Freehold. You can read more about this in our article “Thai Law Property Ownership”. If you still have questions please do not hesitate to contact us anytime. Here you can search for the newest houses for sale in Hua Hin – contact us if you have further questions or if you would like to schedule a viewing. Our real estate agents are happy to help you!